Empower yourself, gain great confidence and boost your self-belief with Brian Mayne’s special Life Mapping Workshop on Saturday 11 March 2017 at Birmingham City Football Club, Birmingham B9 4RL. It’s a fun yet powerful way to bring out your inner brilliance! Life Mapping is a unique personal empowerment system created to help you find your prime purpose in life and be your very best in all that you do. Life Mapping is simple yet extremely powerful. For 20 years it has been helping people to bring out their inner brilliance and develop their winning ways of being in business, education, sports, wellbeing or areas of their personal lives. 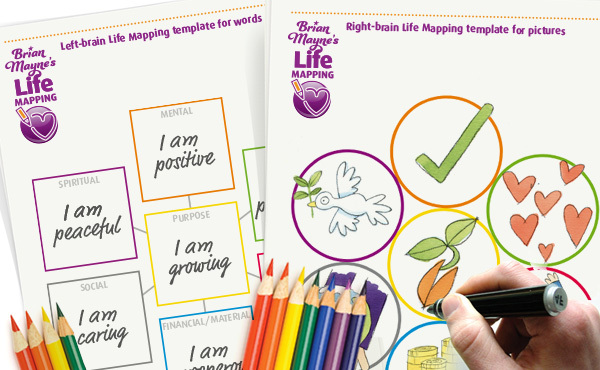 Using a unique combination of words and pictures Life Mapping helps to activate your whole-brain. It powerfully influences your subconscious mind to inspire you to be your best, do your best and have your best results. Brian Mayne’s 1-day Life Mapping Workshop is great way to get started together with a group of like-minded people. At the end of the workshop, you’ll have created a vivid visual map – your personal Life Map – that will enable you to embrace change and integrate all aspects of your potential into one balanced and powerful whole. View this Life Map for a few moments every day and you will strengthen the command to your subconscious, increase your self-confidence, raise your self-esteem and boost your self-belief. This 1-day workshop is focused on helping you learn about Life Mapping – a communication system for your higher guidance, and the way to create a blueprint for whom you choose to become.